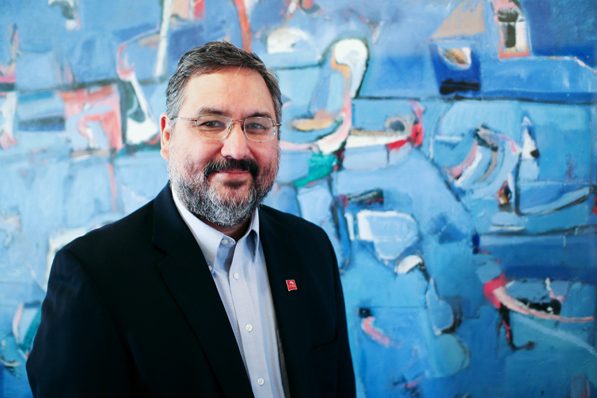 At the University of New Mexico (UNM), Dr. Gil Gonzales is committed to projects focused on bringing technology to underserved areas, and helping minority students get the most out of their academic experience as the college’s chief information officer. But, don’t ask him to define his job. The position, he says, is defined more by the way it evolves than its official description. Here, Gonzales shares with HE how he’s using his role to transform UNM’s campus into a hub of connectivity for the entire region. I’m practicing the role of the chief information officer. I emphasize the word “practice” because it’s a dynamic and changing role based on the evolving maturity of the university, which is always rethinking how technology affects administrative functions as well as academic ones. We have the aim of improving graduation and retention rates. In some ways, the role changes every six months or so. The underlying assumption is that the infrastructure a university needs to be more agile and flexible today is constantly changing. We need to prepare the organization for that change. The CIO’s job is one of the newest jobs in higher education. I never got up one morning and said I’d be a CIO. My keen interest is in understanding how technology can change people’s lives and, more importantly, how it can help minority students. Not only in getting through math, English, writing, and so forth, but also in terms of rethinking the movement of people through our systems. I spent time in Phoenix working with cradle-to-grave projects, understanding how students move from one major part of the education process to another. That idea of thinking about minority students and the use of technology was really my interest in getting into information technology. My background is in history, which means I spent a lot of time thinking about change over time. Technology is exactly that conversation. Sometimes its use is appropriate, sometimes not. We make mistakes, and, thus, have to reinvent ourselves and the underlying assumptions about technology that we make. Early on, I worked at the University of Arizona, at the Mexican-American Studies and Research Center. We were writing grants under Title 7, and those grants were about helping students navigate the complexities of higher education. Taking those experiences and applying them to an entire organization has been the challenge. Technology is the third leg of the stool, the third piece of the environmental experience students need as they work through universities. The other legs are the people themselves—are they prepared, have they selected a discipline, are they working with faculty, etc. The other leg is the business process—is the organization prepared to make a change of business process that can help a student. If we make information available to students, help them with transcripts, get them meal plans, that will help a student succeed. When I worked at California State University, in Monterey Bay, my interests were similar. I was interested in building bridges into the Salinas Valley, helping make sure minority students were successful. In this case, they were focused on deep learning theory: how do you help students understand content that is more than reiteration. Secondary was service learning. We spent a lot of time building in communities. We went out into the city to homeless shelters and food banks. They needed connectivity to work with us. We built relationships up and down the coast. We focused on a couple areas: providing high bandwidth for Internet connectivity. Second, we focused on wireless capabilities. We were interested early on in mobility. For example, we worked with the archaeology department to build wireless lab capacity. They could go out into the field and do a field study in real time, with the data available for class in the afternoon. It was relevant and timely. I was interested in working with organizations that touched minority students, and UNM is the single higher-education research institute in the country that is predominantly minority students. It fit my interest to work in a place that would focus on the education of minority students and particularly Native Americans. We could solve problems on a larger scope. The state of New Mexico has significant broadband deficiencies and a strong need for connectivity in Navajo Nations and small communities, which is a real challenge. There is a sense that it is the university’s role to advocate and support what education should be like. It’s completely fit in to what I was prepared for. We have a new president, Bob Frank, who has clearly articulated the need for the university to be more engaged in the economic development of the state. We need to be more internationally focused, and reinvent UNM as a major player in creating new jobs in our state. For instance, we can create enterprise zones so entrepreneurs can connect if they’re sitting in Taos, New Mexico. Those are the types of things we want to engage in. We want to help reinvent New Mexico as a place where students want to learn, but also want to live. We want businesses to be attracted to the state. We have to have a university that is forward-thinking about programs and infrastructure. That is the next major challenge: finding a balance between required academic experiences, and being a flagship university in the state. The most important thing we’re doing is preparing the environment for students to learn, and to have options for how to learn. We’re engaging with other universities so students can take massive online courses, and so New Mexicans can in fact participate knowing that their flagship university is engaged and innovative. That’s the most important thing we’re doing. The university has a role in the region, and we must accentuate that. The thing I get most excited about is going out and helping students and faculty be critical about their use of technology. In some ways, we’re beginning to lead in the use of technology. That’s really exciting.